The City of Saskatoon continues undertaking improvements to its Transit shelters, bus stops, sidewalks and other related infrastructure. Funded by the City and the Government of Canada, which invested $5.3 million through the Public Transit Infrastructure Fund toward these projects, this work will ultimately help better connect people to this important local transportation network. In Saskatchewan, the federal PTIF program is administered by the provincial government. “Saskatoon can contribute to improving its citizens’ quality of life with projects like these, thanks to the federal Public Transit Infrastructure Fund, which the Government of Saskatchewan administers in the province. Saskatchewan’s eligible municipal partners having access to this federally-funded program helps those communities address their local priorities,” says the Honourable Warren Kaeding Saskatchewan’s Minister of Government Relations. Through its recent Bus Stop Blues campaign, Saskatoon Transit received more than 45 submissions on areas that would benefit from improvements. Submissions were categorized into one of three categories: 1) sidewalk/accessibility, 2) new shelter/ repair, or 3) general maintenance. Three quarters of the submissions received were asking for improvements to the Attridge Drive and Rever Road location. A full listing of the planned improvements can be found at SaskatoonTransit.ca/about-us/projects. 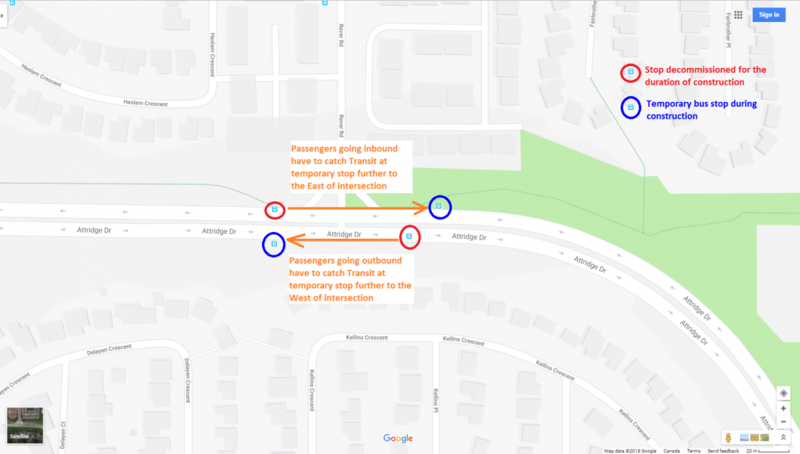 As part of the Bus Rapid Transit (BRT) plans, Attridge and Rever has also been selected for one of the BRT stations which will act as a major transfer point for the area. BRT stations are planned to be built at a height of approximately 10 inches, about 4 inches higher than existing curbs throughout the city. As a pilot, the bus stops at Attridge Drive and Rever Road were built to a height of 10 inches. The raised curbs will improve accessibility by offering near level boarding to accommodate wheelchair access without having to deploy the bus ramp allowing for faster passenger loading times. This is in addition to Saskatoon Transit’s objectives to attain a 100 per cent accessible fleet by the end of 2018. On top of this, the City improved 20 per cent more sidewalk panels than originally projected for 2018. Sidewalk ramps – connecting sidewalks to roadways – were also installed at locations around the city. The locations for both panel and ramp repair/installation were identified based on connectivity to Transit. Additional considerations included public input, Neighbourhood Traffic Review recommendations, and prioritization for those locations where there are no sidewalks on either side of the road. The total investment in these various improvements, including both the Government of Canada’s and City of Saskatoon’s contributions, is more than $10.6 million. Sidewalk and traffic restrictions will be in place around this construction zone for the duration of the project. This necessary work will cause transit riders to use an alternate bus stop during the project. Signage will be in place directing transit riders to the temporary bus stop location. People are encouraged to consult the app called Transit for details. This project will impact Transit routes: 4, 27, 43, 44, and 45. Daily detour updates can be found at SaskatoonTransit.ca/service-alerts, by following @StoonTransit on Twitter and on the app called Transit. Transit service times for special events at SaskTel Centre in October can be found at SaskatoonTransit.ca/plan-my-trip/popular-destinations. Experience the convenience of using Saskatoon Transit to attend all your favourite events. As part of the City’s commitment to reconciliation, a transit shelter was designed in collaboration with students from Aden Bowman Collegiate and Saskatoon Metis Elder, Senator Nora Cummings to be installed in front of the school. Saskatoon Transit’s Bus Shelter Art Project complies with Call to Action #79, calling upon the government, Aboriginal organizations and the arts community, to develop a reconciliation framework for Canadian heritage and commemoration, including integrating Indigenous history, heritage values and memory practices into Canada’s history. The artwork was inspired by Métis history, heritage, values and the memories of Senator Elder Nora Cummings and was laser cut by Metal Shapes Manufacturing. “It was an honour for the art students of Aden Bowman and for me to meet with Métis Elder Nora Cummings and learn about the Métis history in this area,” says Tamara Rusnak, Art teacher at Aden Bowman. Saskatoon Transit completed the first engagement session with Elder Cummings and 19 students at Aden Bowman on May 8, 2018. Elder Cummings spoke specifically to the landscape and the people of the area where Aden Bowman is situated and shared pictures of what the area looked like when she was a young girl. The students were asked to create original, timeless and commemorative art that celebrates the Métis heritage, history, values and memories of Elder Cummings. They created the art for the bus shelter using inspiration from the engagement session, keeping in mind the functionality and design of the shelter. Transit service times for special events at SaskTel Centre can be found at SaskatoonTransit.ca/plan-my-trip/popular-destinations. Experience the convenience of using Saskatoon Transit to attend all your favourite events. Transit service times for special events at SaskTel Centre in September can be found at SaskatoonTransit.ca/plan-my-trip/popular-destinations. Experience the convenience of using Saskatoon Transit to attend all your favourite events. Saskatoon Transit works to anticipate areas of growth and puts a plan in place to accommodate for busy routes. Nonetheless, bus riders are reminded during this time of year that full buses can be expected as students find the routes and times that work best. Riders are reminded that slight schedule adjustments (less than 10 minutes) and transfers to high-frequency corridors along 8th Street, 22nd Street and Attridge Drive will minimize wait times and more importantly there are more buses per hour which means more capacity for riders and more departure options. Special high school and university express routes provide enhanced service for students throughout the school year. Riders are encouraged to use the real-time transit route planning tool on the app called Transit or Google Maps Transit. These apps give departure, arrival and route options. For help with trip planning please call Transit Customer Service at 306-975-3100.